We all want to live longer, but I find most discussions of available interventions unsatisfying because they tend to ignore any consideration of whether the intervention is too expensive (as the joke goes about veganism, you may live longer but will you want to? ), and be simultaneously too gullible (nutrition research; looking at any health parameter which improves) and too narrow-minded (I don’t care if an intervention has p>0.05 if that still means a 90% probability of benefit). ACM is the end-point of choice for life-extension because it is both closest to what we care about (additional life) and it is the hardest of all end-points - it is difficult to cheat, miscount, or not notice, and by being simple, consistent, and unambiguous, avoids many failure modes such as subgroup hacking or dropping outliers or tweaking covariates (either a larger fraction of the controls are dead or not). It also can typically be extracted from most studies, even if they otherwise fail to report much of the data. From a benefit point of view, average reduction in all-cause mortality is excellent for ignoring any zero-sum tradeoffs: it’s no good if reported benefits are only because the doctors writing up a trial kept slicing deaths by different categorizations of causes until they finally found a p<0.05 or if the gains only appear by excluding some deaths as ‘irrelevant’ or if the gains in one cause of death comes at the expense of another cause (is it really helpful to avoid death by heart attack if the intervention just means you die of cancer instead?). For example, one primate study of caloric restriction found benefits only if it excluded a bunch of deaths in the CR group and defined them as not age-related, ignoring “monkeys who died while taking blood samples under anesthesia, from injuries or from infections, such as gastritis and endometriosis.” (Even in the followup paper several years later, the all-cause mortality reduction is much smaller than the “age-related” subcategory.) From a life-extension perspective, it is irrelevant if an intervention reduces some kinds of diseases while making one much more prone to dying from routine causes such as injuries or minor operations under anesthesia (especially since, in modern societies, one is guaranteed to be operated on at some point) - it either reduces all-cause mortality or it doesn’t. Correlation is not causation and correlates only rarely turn out to be usefully causal. With aging, the situation is especially severe since aging is the exponential increase in mortality with time as all bodily systems gradually begin to fail; one cannot simply take a correlation of some chemical with aging or mortality and expect an intervention on it to have more than a minute chance of making a difference, since almost every chemical or substance or biomarker will change with age (eg papers on magnesium levels often note that surprisingly, blood levels of magnesium don’t change substantially with age). Worse, over more than a century of concerted effort and tinkering with a bewildering variety of thousands of interventions from injecting embryos to consuming testicles (or crushing one’s own) to yogurt to yoga, it can safely be said that (almost?) all tried interventions have failed, and the prior odds are strongly against any new one. Studies of interventions in the sick are also unhelpful, as (hopefully!) the benefits observed may come from their particular disorder being treated. Animal studies are also unhelpful as results cross-species are highly unreliable and model organisms may age in entirely different manner from humans, who are unusually long-lived as it is. One challenge for this criteria is studies done in elderly populations: because death rates are so high, they offer higher power to detect reductions in mortality; but because that death rate is pushed so high due to the aging process, they will tend to have many chronic conditions and diseases as well. Do we ignore studies recruiting from, for example, 70-90yos who all inherently have health problems? I would say it’s probably better to err on the side of inclusion here as long as subjects were not selected for any particular health problem. It’s important to include heterogeneity from population to population as part of the uncertainty. One of the subtleties often missed in dealing with modeling is that a 95% CI around a parameter is not a CI around the outcome or result. For making decisions, the costs of the intervention must be taken into account. A taxing exercise regimen may be proven to increase longevity, but is that of any value of the regimen takes away much more of your life than it gives back? It may be that no matter whether our certainty is 99% or 99.99% that it works, we would never choose to embark on that regimen. On the other hand, for a cheap enough intervention, we may be willing to accept substantially lower probability: baby aspirin, for example, costs $7 & <10 seconds each morning / <60 minutes a year and we might be willing to use it if our final probability of any benefit is a mere 50%. Of course, these criteria are stringent: we can, for example, exclude almost everything which might appear in an issue of Life Extension Magazine for being too small, conducted in animals, conducted in sick patients, not being a randomized experiment at all, or reporting benefits only on an extremely specific biological endpoint like some cholesterol-related metric you’ve never heard of. Medical journals don’t offer rich pickings either, as they understandably tend to focus on experiments done in sick people rather than healthy people (apparently there’s more funding for the former - who knew?). And when a randomized experiment is done in healthy adult humans, the experiment may either be too small or have run for too short a time, since annual mortality rates for many participant groups are 1% or less; for any sort of effect to show up, you want (very expensive, very rare) studies which enroll at least a thousand subjects for a decade or more. It would not be surprising if we must intone the ritual ending to all Cochrane Reviews, “there is insufficient evidence for a recommendation”. Fortunately, I do know of a few plausible candidate interventions. For example, baby aspirin has been tested in what must be dozens of trials at this point (generally turning in relative risk/RRs like 0.90 or 0.95 in the meta-analyses), is almost too cheap to bother including the cost, and has minimal side-effects (rarely, internal bleeding); it would not be surprising if a cost-benefit indicated the best decision is taking baby aspirin. Unfortunately, no one has done this sort of thing before, so for my own use, while not an expert on any of the interventions or on health economics in general, I thought I might try to sketch out some such analyses. “a glass a day” has long been noted to correlate with longer life anywhere one looks, but the confounds for moderate responsible drinking are too noticeable to put much faith in it and the debate continues to rage. It’s troubling that the economics literature seems to find health benefits to taxing alcohol, and that the more powerful Mendelian randomization design (while far from infallible) show harm rather than benefit. But the real issue is that despite seeming like the easiest experiment ever to run (hand out free booze), there apparently are no randomized trials. The valuation of one year of life I am using here is $50,000, due to its commonness and conservativeness (some valuations would be much higher, and so tend to favor the use of interventions). 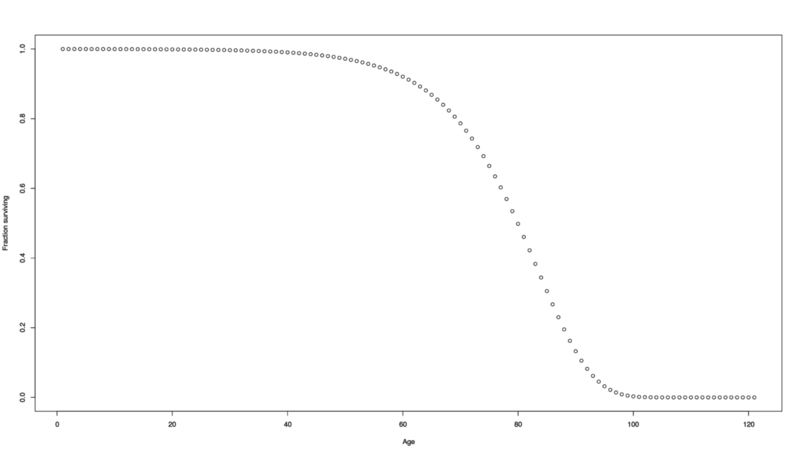 To work with life expectancies and changes in it, I take a standard Gompertz curve model of age-related mortality, using a fit of the modern Dutch population given in Cramer & Kaas 2013. ## then the subject dies at the age at which their first FALSE is found. ## So `TRUE,TRUE,TRUE,FALSE,TRUE,FALSE` ~> died 4yo. A graph of how many additional years a given change in RR causes. The back-loading of mortality means that a constant reduction in mortality risk like an RR of 0.85 would not deliver the naive expectation of 12 years but far less: ~1.6 years. On the plus side, this also means that if we wait to use an intervention until what might seem like ‘late’ in life (like age 30), we have not suffered a large opportunity cost (of ~40%) like one might think, but much less (~1.7%). The gains are minimal early on, and the opportunity cost only begins to really mount starting in one’s 50s or 60s, which has the important implication that such interventions will benefit younger people much less (at least when it comes to interventions which offer only a constant reduction in risk and do not affect the acceleration of mortality caused by the aging process itself) and so the risks are more likely to make interventions profitable. Then we have to take into account the uncertainty that caloric restriction works at all in the extremely elderly (a halving is probably optimistic), the high probability its reduction in mortality will be relatively modest and in the 0.90s, the large financial & time costs of safely doing such a stringent diet (easily thousands of dollars in time and higher-quality food ingredients), the need to learn new recipes and count calories, the possible side-effects like increasing frailty & muscle loss… Given that the upper bound for plausible effect sizes is merely 1 year/$50k, it strikes me as extremely unlikely that such a man could justify CR. Useful interventions are rare and our analyses should incorporate a skeptical informative prior reflecting our knowledge that it is highly unlikely that any particular intervention will genuinely increase life expectancy; in particular, RRs <0.5 (or >2.0) are rare. Since there are no previous compilations of randomized effects for interventions on all-cause mortality in healthy people to use for priors, I fall back on general-purpose but still informative skeptical priors found to work well across many problems by Gelman et al 2008 & Pedroza et al 2015: the Cauchy(0, 2.52) and Normal(0, 0.352) priors. A review of vitamin D meta-analyses reporting on all-cause mortality yields a meta-analytic result of RR=0.96 with little heterogeneity or signs of bias. Reproducing it as a Bayesian random-effects meta-analysis gives a posterior predictive probability P=84% that RR<1.0. The expected life expectancy gain is 0.33 years or $16,800, while total cost of vitamin D supplementation is estimated at $761, for a profit of $15,300. The probability of being profitable is estimated at P=83%. The optimal beginning age is 24yo. Vitamin D3 and vitamin D2 have been researched intensively ever since their discovery for possible benefits for a range of problems, starting with rickets and expanding from there to everything under the sun. Interest in vitamin D is sparked by many correlational results showing low levels of vitamin D in modern Western populations (unsurprising, given how little time people spend in the sun compared to historically) and how low levels correlate and predict with all sorts of bad things - particularly all-cause mortality. The downside is that the literature is so large and heterogeneous that it’s hard to deal with and for many of the uses investigated, there is conflicting evidence. We are fortunate, however: the large research area of bone fractures/falls/osteoporosis in the elderly (collectively, leading causes of death & disability) means many (relatively) large RCTs in (relatively) healthy people are available with meaningful death rates reported. For particularly comprehensive reviews, see Newberry et al 2014 and Theodoratou et al 2014. In addition, vitamin D3 also has considerable plausibility for being profitable: it can be taken in extremely large doses (>10-100x normal daily doses) without much sign of toxicity (leading to a fair number of trials which ensure compliance by just injecting mega-doses of vitamin D every month or year), hypervitaminosis D is rare and not usually fatal, side-effects are rare and minimal, it is already taken by many millions of healthy and sick people without noticeable problems, and vitamin D costs ~$15/year. Examination of 141 single-nucleotide polymorphisms in a discovery cohort of 1514 white participants…Composite outcome of incident hip fracture, myocardial infarction, cancer, and mortality over long-term follow-up….Among Cardiovascular Health Study participants, low 25-hydroxyvitamin D concentration was associated with hazard ratios for risk of the composite outcome of 1.40 (95% CI, 1.12-1.74) for those who had 1 minor allele at rs7968585 and 1.82 (95% CI, 1.31-2.54) for those with 2 minor alleles at rs7968585. In contrast, there was no evidence of an association (estimated hazard ratio, 0.93 [95% CI, 0.70-1.24]) among participants who had 0 minor alleles at this single-nucleotide polymorphism. Table 2 gives associations with all-cause mortality: 1.3 (1.0-1.6); 0.8 (0.7-1.0); 1.2 (0.9-1.5); 0.8 (0.6-1.1); 0.8 (0.6-1.0). We identified [k=]18 independent randomized controlled trials, including 57 311 participants. A total of 4777 deaths from any cause occurred during a trial size-adjusted mean of 5.7 years. Daily doses of vitamin D supplements varied from 300 to 2000 IU. The trial size-adjusted mean daily vitamin D dose was 528 IU. In 9 trials, there was a 1.4- to 5.2-fold difference in serum 25-hydroxyvitamin D between the intervention and control groups. The summary relative risk for mortality from any cause was 0.93 (95% confidence interval, 0.87-0.99). Re-reports Autier & Gandini 2007 and is redundant. Patient-level data were available for 24 869 people in [k=]6 trials (WHI CaD and five randomised, placebo controlled trials of calcium supplements)…The hazard ratio for death (all causes) was 1.04 (0.95 to 1.14, p=0.4). Focused on cancer, not all-cause mortality and so not relevant, but does note some methodological issues that apply to most vitamin D RCTs: subjects often do not take the provided supplements, and may be taking vitamin D on their own; the vitamin D doses used can vary widely; baseline levels of vitamin D in blood also can vary widely, which leads to both greater noise and, given the common U or J-shaped dose-response curves, might hide benefits or cause harm; vitamin D itself might interact with other drugs or supplements (eg Lazzeroni et al note an apparent interaction with estrogen supplementation in the Women’s Health Initiative Trial). Vitamin D decreased all-cause mortality (1854/24,846 (7.5%) versus 2007/25,020 (8.0%); RR 0.93 (95% CI 0.88 to 0.98); p = 0.009; I² = 0%; [k]=15 trials; 49,866 participants; moderate quality evidence), but TSA indicates that this finding could be due to random errors. Accordingly, 56 randomised trials with 95,286 participants provided usable data on mortality…Vitamin D decreased mortality in all 56 trials analysed together (5,920/47,472 (12.5%) vs 6,077/47,814 (12.7%); RR 0.97 (95% confidence interval (CI) 0.94 to 0.99); P = 0.02; I2 = 0%). More than 8% of participants dropped out. ‘Worst-best case’ and ‘best-worst case’ scenario analyses demonstrated that vitamin D could be associated with a dramatic increase or decrease in mortality. When different forms of vitamin D were assessed in separate analyses, only vitamin D3 decreased mortality (4,153/37,817 (11.0%) vs 4,340/38,110 (11.4%); RR 0.94 (95% CI 0.91 to 0.98); P = 0.002; I2 = 0%; 75,927 participants; 38 trials). Vitamin D2, alfacalcidol and calcitriol did not significantly affect mortality. A subgroup analysis of trials at high risk of bias suggested that vitamin D2 may even increase mortality, but this finding could be due to random errors. Trial sequential analysis supported our finding regarding vitamin D3, with the cumulative Z-score breaking the trial sequential monitoring boundary for benefit, corresponding to 150 people treated over five years to prevent one additional death. We did not observe any statistically significant differences in the effect of vitamin D on mortality in subgroup analyses of trials at low risk of bias compared with trials at high risk of bias; of trials using placebo compared with trials using no intervention in the control group; of trials with no risk of industry bias compared with trials with risk of industry bias; of trials assessing primary prevention compared with trials assessing secondary prevention; of trials including participants with vitamin D level below 20 ng/mL at entry compared with trials including participants with vitamin D levels equal to or greater than 20 ng/mL at entry; of trials including ambulatory participants compared with trials including institutionalised participants; of trials using concomitant calcium supplementation compared with trials without calcium; of trials using a dose below 800 IU per day compared with trials using doses above 800 IU per day; and of trials including only women compared with trials including both sexes or only men. Note that despite the almost identical author, date, & year, this differs from the other Bjelakovic et al 2014 Cochrane review in focusing on mortality rather than cancer prevention. In randomised controlled trials, relative risks for all cause mortality were 0.89 (0.80 to 0.99) for vitamin D3 supplementation and 1.04 (0.97 to 1.11) for vitamin D2 supplementation. k=22 total: k=14 for vitamin D3 and k=8 for vitamin D2. For the re-analysis conducted in the original report, they excluded 5 of 18 trials in the Autier 2007 meta-analysis: One trial was on patients with congestive heart failure,206 one was published only in abstract form,207 in one trial the controls also received supplementation with vitamin D, albeit with a smaller dose,208 and two trials used vitamin D injections.209,210 One additional eligible RCT (Lyons 2007)185 was identified and included in our meta-analysis….3 RCTs from the previous systematic review [based on Autier & Gandini 2007?] and an additional C rated RCT were included in our reanalysis. [k=4] Three used daily doses that ranged between 400 and 880 IU, and one used 100,000 IU every 3 months. Our meta-analysis of the 4 RCTs (13,833 participants) shows absence of significant effects of vitamin D supplementation on all-cause mortality (RR = 0.97, 95% CI: 0.92, 1.02; random effects model). There is little evidence for between-study heterogeneity in these analyses. As the selection is so limited, Newberry et al 2014 is redundant with the others. 10 (7%) outcomes were examined by both meta-analyses of observational studies and meta-analyses of randomised controlled trials: cardiovascular disease, hypertension, birth weight, birth length, head circumference at birth, small for gestational age birth, mortality in patients with chronic kidney disease, all cause mortality, fractures, and hip fractures (table 5⇓). The direction of the association/effect and level of statistical significance was concordant only for birth weight, but this outcome could not be tested for hints of bias in the meta-analysis of observational studies (owing to lack of the individual data). The direction of the association/effect but not the level of statistical significance was concordant in 6 outcomes (cardiovascular disease, hypertension, birth length, head circumference small for gestational age births, and all cause mortality), but only 2 of them (cardiovascular disease and hypertension) could be tested and were found to be free from hint of bias and of low heterogeneity in the meta-analyses of observational studies. For mortality in chronic kidney disease patients, fractures in older populations, and hip fractures , both the direction and the level of significance of the association/effect were not concordant. The overall thrust of the meta-analyses is that there is consistent and substantial evidence that regular vitamin D3 supplementation reduces all-cause mortality somewhere in the RR=0.90-1 range, that vitamin D2 may be worse but calcium seems irrelevant, and this effect seems to be general: the observable between-study heterogeneity is very small despite large differences in subject populations by gender, age, and dosage, and subgroup analyses do not find the effect confined to particular demographics or that a reduction in a particular disease is driving the ACM reduction (which while potentially due to lack of power, would be consistent with the generality of benefits in both the correlational and Mendelian randomization studies). The meta-analysis itself can be reproduced given Bolland’s forest plot & table, Figure 5. 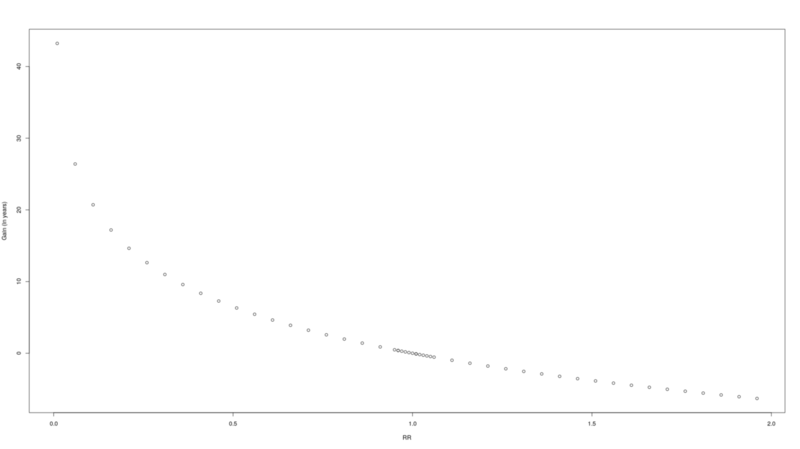 # of 0.203 and larger for Group 2 by a probability of 0.797 . Hence, vitamin D supplementation could be worth <=$16.8k. 14. Rejnmark L, Avenell A, Masud T, et al. “Vitamin D with calcium reduces mortality: patient level pooled analysis of 70,528 patients from eight major vitamin D trials”. J Clin Endocrinol Metab 2012; 97: 2670-81. I’m not sure I agree. The mechanistic theory and correlations do not predict that 400IU is ideal, it doesn’t seem enough to get blood serum levels of 25(OH)D particularly higher, and I don’t read Rejnmark the same way: the Figure 3 forest plot, to me, shows that after correcting for Smith’s use of D2 rather than D3 (D2 usually performs worse), that there are too few studies using higher doses to make any kind of claim (Table 1; almost all the daily studies use <=20μg), and the studies which we do have tend to point to higher being better within this restricted range of dosages. That said, I cannot prove that 5k IU is equally or more effective, so if anyone is feeling risk-averse or dubious on that score, they should stick with 800IU doses. A year of daily 800IU doses costs almost the same as higher IU dosages since the vitamin D itself is only a small part of the cost of manufacturing. Alternately, if one is unconcerned about the different between daily and more intermittent doses (reasoning that due to the fat-solubility it should not make any difference), one could take a 5k IU dose on a weekly basis, thereby cutting the annual dose cost from ~$11 to ~$2. Due to rarity, effectively zero: the listed side-effects are all so rare or minor that I can’t come up with any reasonable estimate of cost. What RR would wipe out the gains from vitamin D, and how likely is an RR that pessimistic? The window of unprofitability is so narrow that it doesn’t much change the probability. Metformin is a standard drug prescribed to diabetics since the 1950s, known for helping control blood sugar while being cheap and safe; it has been used by scores of millions of people. Alongside the blood sugar benefits, there appear to be other benefits relating to cancer and cardiovascular health, and possibly even all-cause mortality. There is enough public interest that I heard of it, and as it passes the sniff test, I decided to look into it further. Overall, metformin is promising and under my set of assumptions, profitable for people aged >=45yo to use. This, however, entirely hinges on one’s evaluation of the credibility of the correlational evidence and ability to tolerate the surprisingly common & unpleasant side-effects like diarrhea. RR=0.97 in active-comparator trials and 1.074 in placebo trials; overall, too underpowered to detect ACM of the plausible effect sizes but did find a trend towards larger reductions in longer trials. ACM was split by comparison to placebo and comparison to another diabetic drug: 0.97 & 0.94. Diabetics taking metformin had significantly lower all-cause mortality than non-diabetics (hazard ratio (HR)= 0.93, 95%CI 0.88-0.99), as did diabetics taking metformin compared to diabetics receiving non-metformin therapies (HR= 0.72, 95%CI 0.65-0.80), insulin (HR=0.68, 95%CI 0.63-0.75) or sulphonylurea (HR= 0.80, 95%CI 0.66-0.97). Some of the biochemical & animal experimental background suggesting benefits may be generalizability to healthy people, with proposals that metformin is mimicking caloric restriction by subtly reducing efficiency of mitochondria, making the body think it is in a food-scarce state. TAME seems to be prompted in part by Bannister et al 2014, “Can people with type 2 diabetes live longer than those without? A comparison of mortality in people initiated with metformin or sulphonylurea monotherapy and matched, non-diabetic controls”, a very large but nevertheless correlative result. There also appears to not be much consistency in the correlation results, with competing meta-analyses on various permutations of comparisons. So I will apply my proposed correlation!=causality correction of 33% to deflate the expected value. We identified 78 241 subjects treated with metformin, 12 222 treated with sulphonylurea, and 90 463 matched subjects without diabetes. This resulted in a total, censored follow-up period of 503 384 years. There were 7498 deaths in total, representing unadjusted mortality rates of 14.4 and 15.2, and 50.9 and 28.7 deaths per 1000 person-years for metformin monotherapy and their matched controls, and sulphonylurea monotherapy and their matched controls, respectively. With reference to observed survival in diabetic patients initiated with metformin monotherapy [survival time ratio (STR) = 1.0], adjusted median survival time was 15% lower (STR = 0.85, 95% CI 0.81-0.90) in matched individuals without diabetes and 38% lower (0.62, 0.58-0.66) in diabetic patients treated with sulphonylurea monotherapy. The log-logistic model resulted in the best fit in terms of AIC, and the adequacy of this distribution was further assessed by plotting appropriately transformed non-parametric estimates against time. The log-logistic survival model provides beta coefficients that equal the difference in log survival time between groups or for continuous predictors. Exponentiation of the beta coefficient gives the ratio between median survival times, known as the survival time ratio (STR), or acceleration factor. STRs less than 1 represent a decrease in survival time; values greater than 1 represent prolonged survival. …In total, there were 7498 deaths, corresponding to an unadjusted event rate of 18.1 deaths per 1000 person-years. Unadjusted event rates were highest in the sulphonylurea group and lowest in the metformin group (50.9 vs. 14.4 per 1000 person-years, respectively; p < 0.001; Table 2). Unadjusted event rates were higher in sulphonylurea-treated patients than in their matched, non-diabetic controls (50.9 vs. 28.7 per 1000 person-years, respectively; p < 0.001) but, surprisingly, were lower in those treated with metformin than in their matched controls (14.4 vs. 15.2 per 1000 person-years, respectively; p = 0.054). Unadjusted event rates were lowest in people aged <60 years at index date and highest for people aged >70 years for both diabetic and control subjects. So I think if we wanted to convert to something else, STR has already done the denominator for us and we just divide 14.215.2 to get the raw RR of 0.93, which is not as good as the quoted STR of 0.85 (0.81-0.90), indicating that the covariates do differ a bit systematically? Looking at table 1, the metformin group seems to have been previously treated for many more disorders, explaining why the models think metformin is so good (because the metformin users should be dying off faster yet have a similar death rate as the healthy controls) Table 2 gives overall figures for all-cause mortality: n=78241, 2663 deaths in metformin (266378241=0.03403586355); n=78241, 2669 deaths in their controls (266978241=0.03411254969) (0.034035863550.03411254969=0.9977519669). Pooling in the sulphonylurea controls as well: n=748 deaths plus the 2669 other controls, total controls n=90463, total deaths 3417 (341790463=0.03777234892) (0.034035863550.03777234892=0.9010788188). So that verifies the RR of 0.93 since the difference between 0.90 and 0.93 is probably due to the differences in total followup years. Metformin is said to be very cheap. How cheap is cheap? Bannister et al 2014 doesn’t give dosages or look for a dose-response curve but since it’s drawing on clinical records, the diabetics must be using conventional dosages. Drugs.com gives a maintenance dose of 2000mg/daily; the Mayo Clinic says not usually more than 2000-2500mg/daily; the anti-aging quacks tend to suggest ~1000mg/daily for non-diabetics; the MILES protocol calls for 1700mg/daily. I’ll use 2000mg/daily here, which is 4x500mg doses. The main side-effect mentioned as potentially fatal is lactic acidosis - for example, of the 12 New Zealand cases 1977-1998, 8 were fatal & the FDA prescribing information estimates 50%, which does not sound fun. On the other hand, lactic acidosis seems to be an acute disorder whose primary effect would be killing you, so it should already be taken care of by working with a reduction in all-cause mortality (that is, even if you are more likely to die by lactic acidosis, the metformin must be sparing you even more gruesome deaths and on average it’s still helpful). And the lactic acidosis rates (2-9 per 100,000 person-years, so at 50 years of usage as prophylactic, a risk of 9100000⋅50⋅812=0.003) may simply reflect the pre-existing morbidity of diabetics and not caused by metformin, and so not a concern at all. So for side-effects, I think we can sum it up as a month or two of diarrhea, which is unpleasant but not that big a deal. I wouldn’t pay more than $50/day or so to get rid of some diarrhea, which over two months is $3000, but that’s somewhat unlikely. <$9.2k is a little under an order of magnitude smaller than the more conservative RR estimate, giving a gain of $69k for RR=0.85. So metformin use is probably profitable for our 30yo. Apparently there is an optimal age - and it’s not 30yo but 45yo (metformin is profitable enough that starting too early, rather than never, is still a good idea). So quite aside from waiting for better information like the MILES results, our hypothetical 30yo still should wait a long time before starting to use metformin. Also unsurprising is that ~90yo, mortality rates become so high that the metformin reduction yields such a small absolute gain of time that it can no longer offset the fixed absolute cost of metformin. So if one doesn’t believe the true causal ACM RR is <=0.95, then metformin use may not be advisable. Using the previously defined gompertzPower function, we can ask a question like: assuming a clinical trial is investigating a claimed RR of 0.85, plans to enrol 3000 people aged 70yo, so presumably 1500 in each arm, and will followup for 5 years (a trial which bears a certain resemblance to plans for TAME); how often would the observed RR<1.0? So it is highly unlikely (~10%) we could expect the realistic trial to deliver a statistically-significant reduction in mortality. (This lack of power for statistical-significance on ACM may be why the TAME investigators talk primarily about looking for reductions in cancer/heart attacks/strokes: as more common events than death, reductions will show up more clearly there, as they do in past metformin trials.) We don’t necessarily care about statistical-significance, since this is a decision-analysis approach: our question is whether the gained data shifts the posterior probability enough to change the optimal decision. But it’s good to have an idea of power in that sense to make it easier to interpret the research article & media reports (eg the trial might be a ‘failure’ from the point of view of statistical-significance, even as it increases the profitability of using metformin). If we really wanted 80% power for p<0.05, how big a sample do we need? In this case, it turns out to be ~7500 per arm (after any attrition) or ~15k total. Such large RCTs are difficult to run and motivate the search for quicker & more continuous measures, like Horvath’s epigenetic clock; unfortunately, biomarkers have a bad track record of measuring causal effects on the hard endpoints of interest, such as mortality (eg epigenetic clocks don’t always work: Thompson et al 2018).